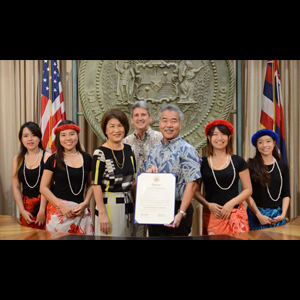 Governor David Ige honored International Education Week 2016 in a signed proclamation presented to the Study Hawaii Educational Consortium during a ceremony at the State Capitol on November 18.
International Education Week is an annual national and international celebration of the contributions of international education in global cooperation and bridging gaps for people worldwide. The governor remarked that diversity and cross cultural understanding are hallmarks of our state. University of Hawaii President David Lassner also spoke at the ceremony, observing that Hawaii’s community across public and private educational sectors were present to share this event. He noted that international education is fundamental at UH and described an array of events presented by students, faculty and guests throughout the week on campuses statewide. Study Hawaii members represent a range of educational institutions in Hawaii, including public and private higher education, K–12 preparatory schools and language schools. Members support international education in the belief that it is critical to fostering peace, security, well-being and addressing global challenges that transcend national borders. 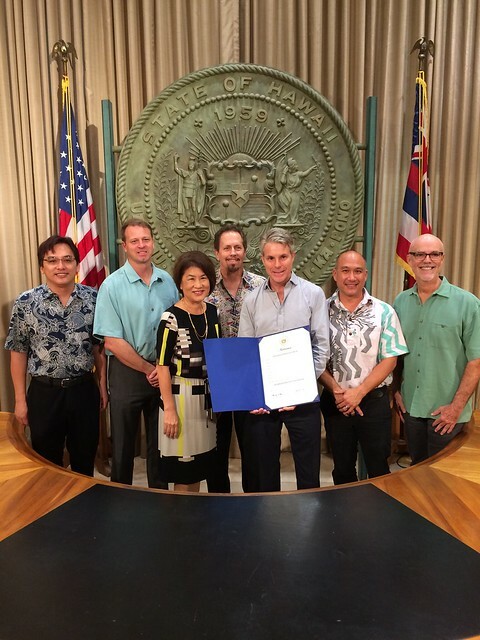 The governor’s proclamation was presented to Study Hawaii President Todd Shumway of UH Hilo and Vice President Joel Weaver of UH Manoa. Students from two Japanese universities currently attending the UH Manoa HELP program performed a hula they learned during their stay in Hawaii. Click through the flickr album below to view photos from the ceremony.